UC Santa Cruz has met the requirements to receive a $700,000 challenge grant from the Kresge Foundation toward the modernization and expansion of McHenry Library. The Library successfully raised $3.5 million over the past 18 months for the gift to come to the campus. Astrid von Soosten, director of Library Development, noted that more than 1,000 donors helped make the Kresge challenge grant a reality. "Private gifts by alumni, staff, and community members like Bill Ackerknecht--a UCSC neighbor--made the difference," said von Soosten. "Mr. Ackerknecht's gift, in memory of his late wife Mary, funded the Great Reading Lawn where today students enjoy wireless internet access as they study in the sunshine." "The library's state-of-the-art Media Center was made possible by the gift of retired library employee, David Kirk," von Soosten added. "And the much needed and heavily used Library Instruction and Outreach Rooms were supported by alumnus Mike Graydon (Cowell '70) and his wife Sally." The Kresge Foundation grant was designed on a challenge basis to support the McHenry Library Expansion and Renovation capital campaign. It was intended to assist UCSC in raising the balance required to complete its campaign goal and the funding of the project. 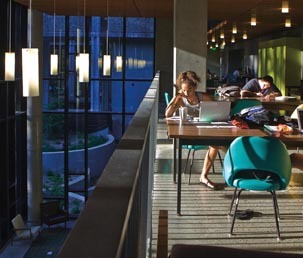 "The Kresge grant really challenged us as a community to join together to support this project and enable the expansion and renovation of UCSC's landmark McHenry Library," noted University Librarian Ginny Steel. "It was a wonderful opportunity to help us raise the funds we needed to totally transform McHenry Library and make it a 21st century destination for a new generation of library users," Steel added. "We are thrilled by the success of the campaign." The Kresge Foundation is a private organization that supports communities by building the capacity of nonprofit organizations in the fields of health, the environment, arts and culture, education, human services, and community development. Last year, the foundation awarded 442 grants throughout the United States, Canada, the United Kingdom, and South Africa, totaling $178 million. Construction at McHenry Library is scheduled to be completed by August of 2010. The building will then be furnished and inspected, with a final move-in date set for December of 2010. For more information, contact the UCSC Library Development Office at (831) 459-5870.